I lost one friend on Sunday night when he went back home to the UK, but another one flew in on Saturday night to keep me occupied. This one is here to stay in Toronto for the next year, so a girls roadtrip was on the agenda. 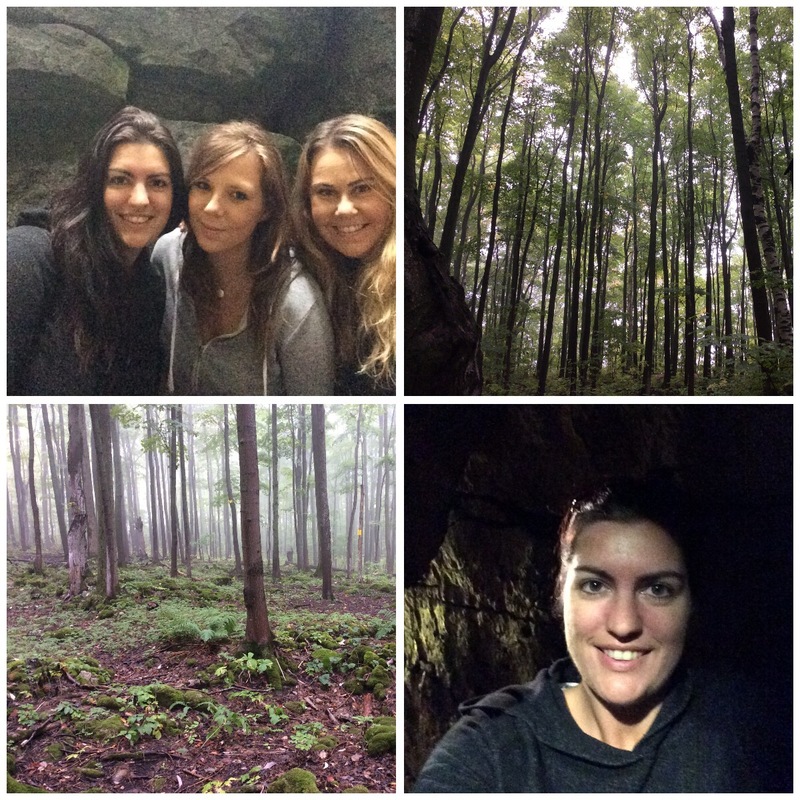 We rented a car and three of us headed just over two hours north to Collingwood for a spot of touristing at the Scenic Caves. It was grey, rainy and miserable most of the way up there, but luckily the rain stopped when we arrived. The woods were pretty and it was quiet with hardly anyone else on the trail. Probably for the best as we were not keeping the peace – talking non stop after not all seeing each other for months. The caves were fun to explore with stories about the beliefs of the native people that once lived there. There was a rock marked called Ekarenniondi where it said they would ‘draw the brains out of the heads of the dead and keep them’. This was to remove memories so they would not recall their past lives or those left behind. There was another spot called Suicide Point. Legend says that there was a woman who once fell in love with a man from another tribe, he was thrown to his death here by her own jealous tribe and she later killed herself in the same spot. The views when we first got to some of the check points on this trail were obscured by mist, but as we were leaving, the mist cleared giving us pretty views for miles towards Georgian Bay. The leaves are gorgeous colours as Autumn is developing and the drive up all provided us with bright multicoloured foliage. After the trail, where we realised we are all hideously unfit!, we stopped to take hundreds more photos and for me to feed the fish/ seagulls. 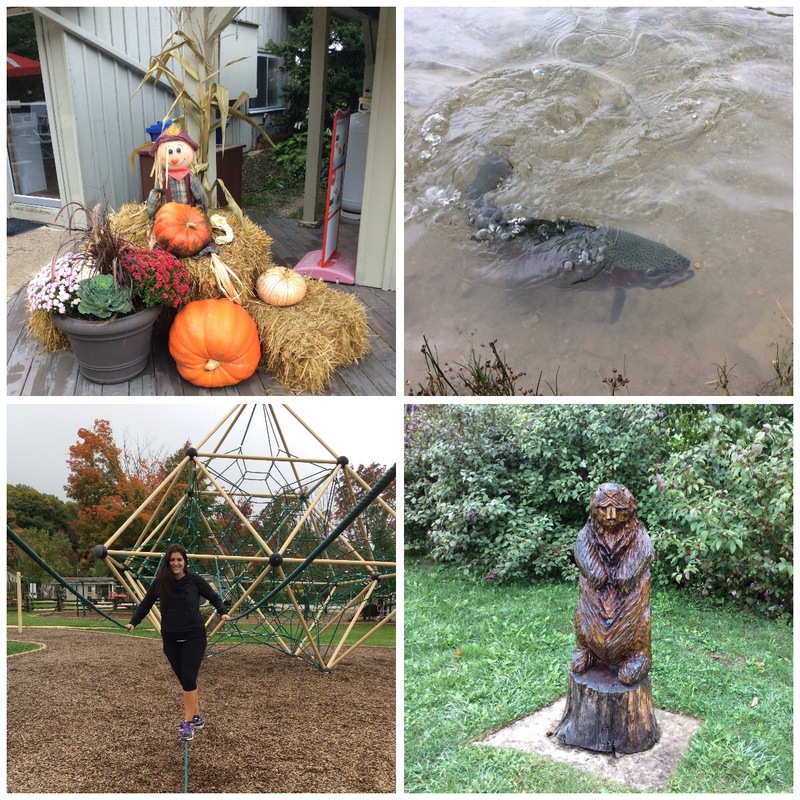 We had a little potter about in the children’s playground, saw numerous carved wooden animals and checked out the thanksgiving displays that seem to be cropping up throughout Canda ready for next weekend. Our next destination was the suspension bridge. This was at the same site as the caves. 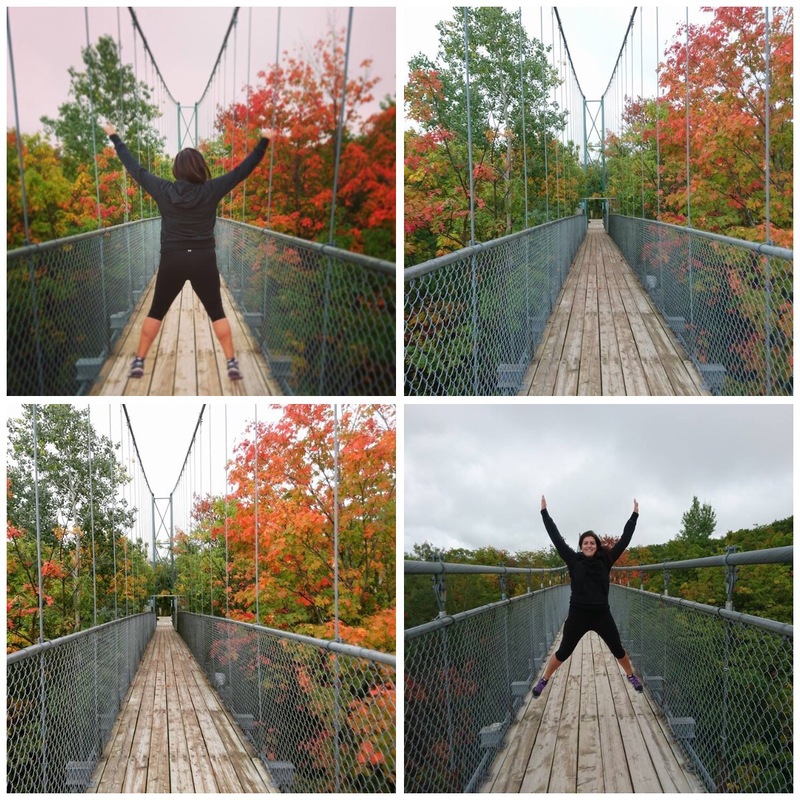 At the highest point, the suspension bridge puts you at the same height as the Eiffel Tower. I have to say, this felt a lot safer than the Eiffel Tower!! I was more than happy to jump up and down and run around playing on this bridge feeling it sway and wobble, whereas the Eiffel Tower felt far scarier and was a much more sensible affair. We were up in the trees with the lovely colours. I would love to visit here every week for the next two months and watch the colours gradually change as winter approaches. 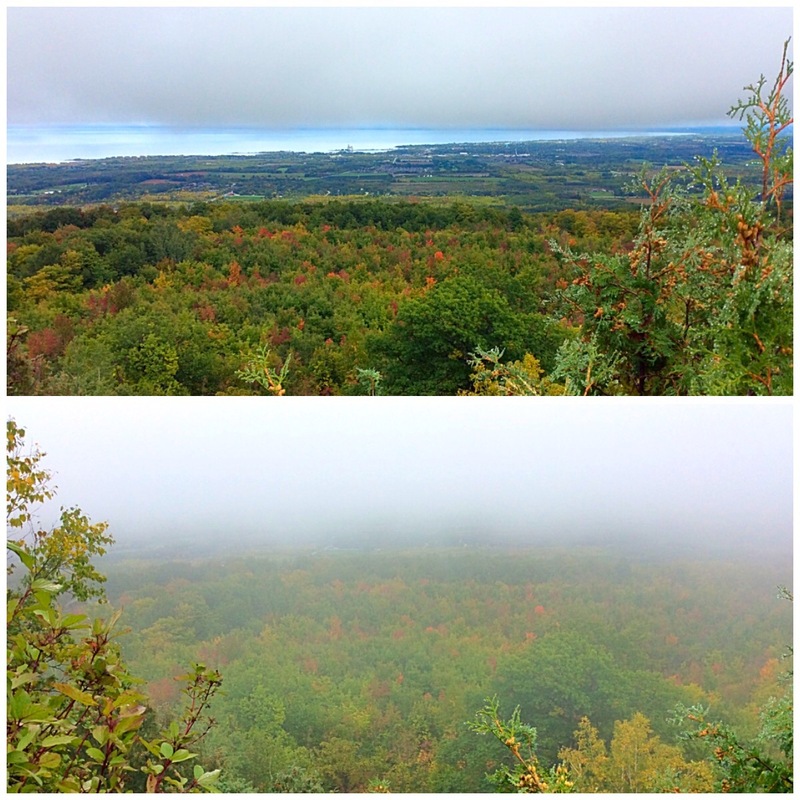 With plenty of daylight hours to savour, we drove ten minutes to Blue Mountain. 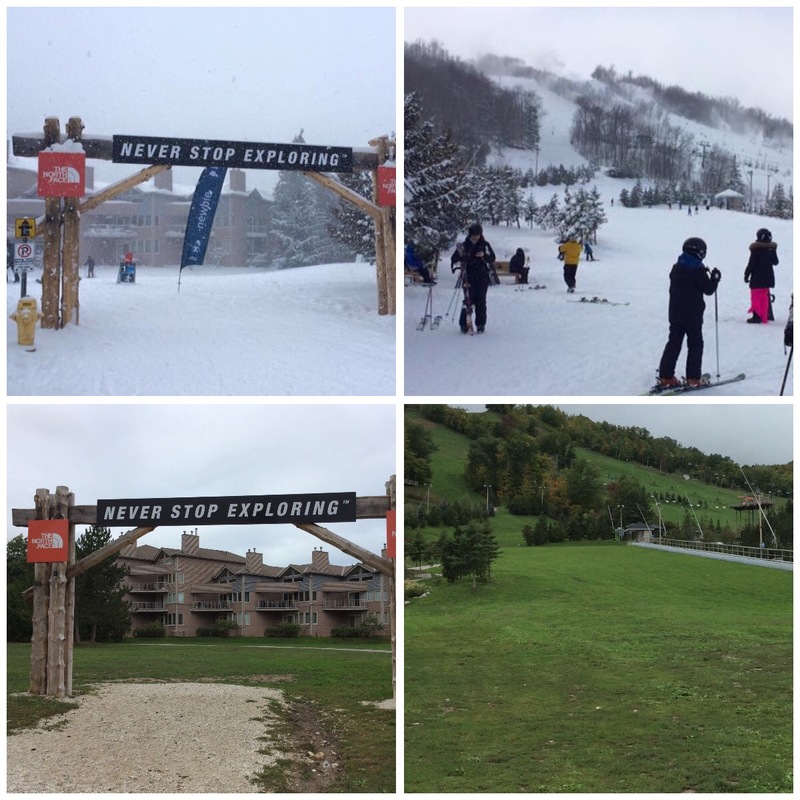 This is where I came to ski in Feburary, so it was interesting to see the contrast between then and now. I definitely preferred it covered in snow. It is so cosy in the winter and the slopes look scarier covered in snow. We plan to return and get out on those beginners slopes. I intend to master the hardest one this time without quite so many impromptu sit downs. Blue Mountain was followed by a drive out to Wasaga as one of my chums hasn’t seen the beach there. Our final two stops before heading back to Toronto were two waterfalls. I think it has become apparent from my adventures that I do enjoy a waterfall. I think I still have over 90 to discover in Hamilton alone, so I have lots to keep me occupied. 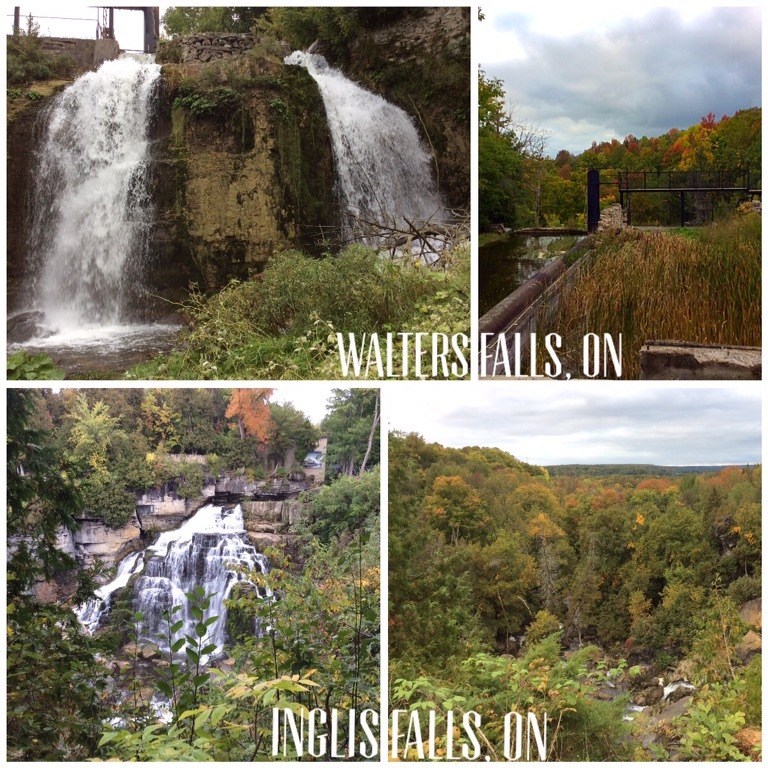 We went to Walters Falls a little West of Collingwood and Inglis Falls, a little further west again. Walters Falls was pretty, but you couldn’t see much from the top. I had the bright idea of a solo adventure to the bottom, ending with muddy knees and hands after skidding down and crawling up a bare muddy slope determined to get my photo from the bottom. Right now, I think it was totally worth it. I might feel some of those slips in the morning and change my mind. One final scenic destination to take some snaps at Inglis Falls and we headed home. Unfortunately, there was no pretty sunset to be seen above the trees as the mist was descending again. Wendy’s chicken nuggets and square burgers saw us through the last legs of the journey and our day of adventuring had to come to an end.